Chicago’s prince of oddball pop Ezra Furman takes a slanted and enchanted approach to making music on third album Perpetual Motion People.Furman follows up the highly acclaimed 2013 release Day of the Dog with a record that mixes up the pop jigsaw pieces to produce something that is hugely inventive, rewarding and constantly surprising. It’s fuelled by a nervous, twitchy energy and pulls from a bewildering array of influences, hopping genres with consummate ease. On opener ‘Restless Year’ Furman riffs over a clattering beat, name checking Dostoevsky and Tom Sawyer while singing ‘Making my rounds in my five dollar dress, I can’t go home, no I’m not homeless, I’m just another savage in the wilderness, And if you can’t calm down you can listen to this..’ with admirable ferocity. Furman’s vision of pop is one that seems blissfully unaware of current trends and fashions – the doo-wop backing vocals and sax attack of ‘Lousy Connection’ form the backdrop for one of the many hook laden tunes on an album generously stocked with them. ‘Haunted Head’ has an authentically Bowie-esque feel while ‘Hour of Deepest Need’ mines more grizzled territory, the low-fi country charm of Neil Young an obvious reference point. On ‘Ordinary Life’ Furman claims ‘I’m sick of this record already..’ but songs like ‘Tip of a Match’ and ‘Body Was Made’ continue in the same impressively raucous, inventive vein, ensuring that boredom is never a factor. Furman’s genius is in his ability to marry a diverse array of sounds and influences and turn them into something cohesive and uniquely his own. 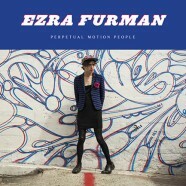 With Perpetual Motion People, Ezra Furman has produced one of the 2015’s most wildly inventive pop statements – he continues to operate in the margins, some distance from pop music’s rigidly formulaic core and for that we should be thankful.